You will contemplate the 4 cardinal points, the head in the stars! 120m2 apartment on the 19th floor, the heart of town. Terraces all around the house. fitted kitchen (fridge./ Freezer, stove, microwave, dishwasher, small appliances .., dishes, pots and all the equipment to ensure your meals. integrated ceiling audio system. Large living room with sofa, armchair (138cm curved TV, bluray, HIFI and acoustic Bose) .Grande dining table. 2 rooms with beautiful bedding Relax (160x200) and Imperial Pullman (160x210 with pillow-top mattresses), offices, TV wall, shutters and blackout curtains. Relaxation room with daybed (double bed 80x190) TV, desk, blackout curtains and shutters. Bathroom. Bathroom with spa bath, hairdryer, shower and integrated sound system in the ceiling. Bathrobes and towels. Bathroom with washer-dryer, sink and toilet and a table and iron. Bathroom. We have a cot and high chair. First aid kit and a cleaning kit for shoes high-end furniture. The beds are made on arrival. The apartment has the category 4 stars. BATHROOM: With a spa bath. Showers. embedded audio. Programmer heating and heated towel rail. Bathrobes, hair dryer. magnifying mirror. BATHROOM: Sink and extra toilet. With washer dryer products. Pressure reducer to small machine and clamps.,stool. Iron and ironing board; first aid kit; shoe cleaning kit. Wonderful property, wonderful location and wonderful host! We spent two days in this apartment and loved every minute. Maria was so helpful, friendly and efficient which made all the difference. The apartment is beautiful, well thought out and all our needs were met. It is very modern, magnificent views and comfortable beds. I highly recommend the 360 Tour Perret! We hope you see very soon. An amazing apartment with a stunning view and location! Our stay in Amiens in 360 Tour Perret was great. Maria was a lovely host and our check in was easy. Maria showed us everything about the apartment and gave us many local tips. The apartment accomodated the four of us very comfortably and the amenities were fantastic. It was a nice modern space with lovely touches that made it feel very homely. The kitchen was very well equipped for cooking or just enjoying take away dinner and the bathroom was great (with a lovely bath). We had a fantastic stay in Amiens and would definitely stay in this apartment again! Thanks very much for your words so pleasant. I am very happy when the people is satisfied. It's was a great pleasure to welcome you. This apartment in Amiens is a remarkable place. On the 19th floor of the Perret Tower (a 1950's brutalist modern building across from the train station), it has 360 degree views of the city, including one of the back of the cathedral. The apartment is very well designed and furnished. The beds are extremely comfortable, the bathroom is very good (with a great shower), and the kitchen is exceptionally well supplied for someone who likes to cook (a treat in Amiens because the indoor market is wonderful). But the very best thing about this flat is the owner, Maria Quevauvillers. She is so kind, thoughtful, and generous - she will do everything to make your stay in Amiens memorable. A superb hostess and a pleasure to know - many, many thanks, Maria! Je suis très touchée par les éloges de mes voyageurs. Leur sympathie et ouverture d'esprit m'ont aidé à optimiser leur séjour une fois de plus. Très soigneux et respectueux du logement. Ce qui m'incite à accueillir mes voyageurs le mieux possible en prenant soin du détail. C'était un plaisir de vous accueillir. Mes voyageurs sont toujours très agréablement surpris des prestations, du confort de chambres et du panorama époustouflant et magique à 360 °. Appartement, vue et accueil superbes!! Nous avons passé un très agréable séjour dans ce très bel appartement, superbement agencé. L'accueil est à la hauteur de la vue panoramique: enchanteur!! Je tiens à vous remercier pour ces éloges. Je veille à que les personnes qui séjournent chez nous puissent profiter au maximum et d'une manière sereine; donc j'essaye de m'occuper des détails afin d'optimiser leur séjour. C'est un grand plaisir d'accueillir de personnes aussi sympathiques et chaleureuses. A très bientôt, avec la famille au complet! Je suis très touchée par vos éloges. Votre sympathie et esprit chaleureux et communicatif m'ont agréablement surpris. J'avais l'impression s'être déjà rencontrés. Je serais très contente de vous revoir avec l'arrivée des beaux jours. A bientôt!! Our gastronomic partners: Brasserie Jules, The Seven (Steak Burger Pizza) or other specialty restaurants and all local shops less than 5 minutes. You have the bakery / pastry shop and tea room at the foot of the building. Or the famous Petit Poucet (caterer, pastry chef and glacier). A multiplex to see the film of your choice. Underground parking and protected 24h / 24 in less than 2 minutes for motorists and ability to unload the business in front of al tower. 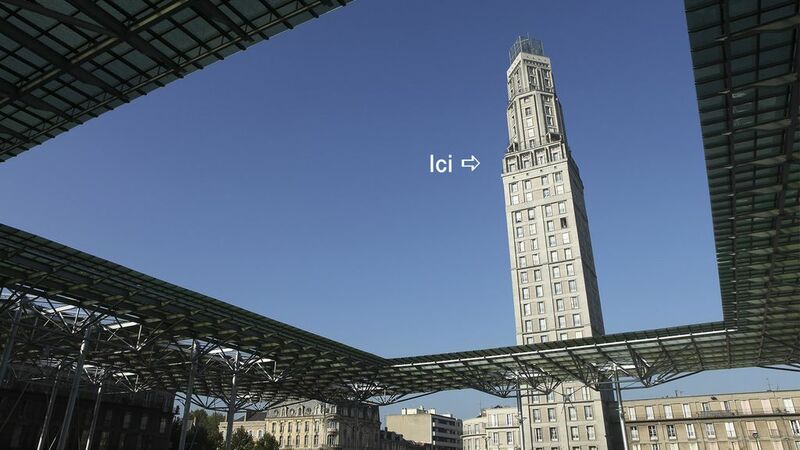 Gare SNCF, the Ouibus, taxi station, bus and bicycle rentals to the tower.